Hello everybody! I hope you are enjoying your lovely Spring weather. I have to resentfully report that it’s still Winter here. The sun was out the last few days, but it’s grey and cloudy again today. The snow is somehow melting despite how freezing it is outside, but I have yet to really feel like the cold is over. It even snowed for a bit this afternoon. I snuck away from Regina and my internship from April 3-7 to go to sunny La Jolla, California for the annual ADAA research conference. Holly, Michelle and I flew down early together to have a day of shopping and relaxing before the conference got started Thursday night. We left the hotel mid-morning on Thursday for a short walk to a nearby grocery store, where I learned the joys of genuinely ripe mango, pour-your-own-honey, fresh seafood, and just-prepared tubs of guacamole and salsa. I think it would be fun to stay at a place with a kitchenette and cook meals with all the fresh food there! Right next to the grocery store was a paper/scrapbooking store, where I probably confused the girls by buying $80 worth of paper. Worth it. 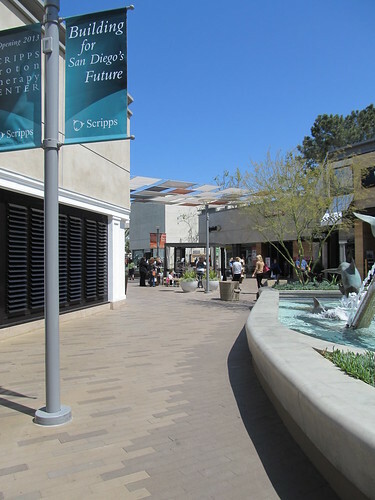 Just a couple blocks away we found an outdoor shopping mall with basically all of my favorite stores. I killed a lot of money and I wasn’t alone. I don’t ever swim but I bought a new swimsuit anyways. However, I always walk and I bought new shoes, so I think that balances out the practicality. The mall had everything from Sephora to Tiffany&Co, Forever21 to Guess, and an outdoor patio area with live performance. I managed to get a little bit of sunshine, though I didn’t end up with any necklace-shaped sunburns like I did in Washington last year. After we headed back to the hotel to drop off our goods, the conference started in full swing. Thursday night there was a keynote speaker and an outdoor, poolside reception. There was a huge Regina contingent at ADAA this year and it was nice to catch up with everybody. I managed to take in two symposium sets on Friday, both on PTSD and the military, and which will inform a lot of the research my lab is doing in upcoming years. A bunch of us took a lunch break involving The Best Sushi I have ever had (though unfortunately also some of the worst service I’ve ever had). I spent a good chunk of time preparing for a talk of my own scheduled for Saturday morning. Friday night many of my labmates were presenting posters, so we hung out at the poster session and had drinks at the hotel bar afterwards. Saturday – scary day! – I had my first ever conference talk at 8:30 am. I spoke about a publication we just put out looking at the relationship between intolerance of uncertainty and risk for developing PTSD. It was modestly attended, mostly by Regina crew, but it was a good confidence-building exercise and a great experience. I have to give a talk at CPA this June on a topic I know nothing about so it was good to practice with a topic I know a lot about. The rest of the day was spent in poster sessions and talks given by Gord and Nick. 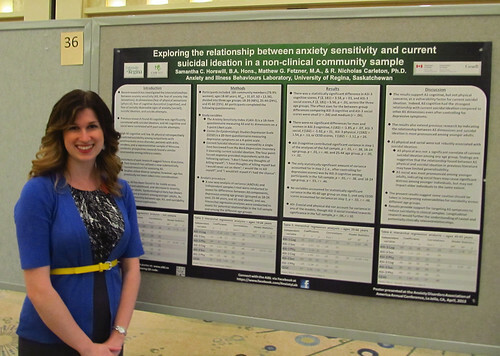 My own poster session was that evening, and was probably the highlight of my whole weekend. I was able to chat with the grad student whose research spurred our own research, as well as one of the co-chairs of the ADAA committee for public education, and one of my personal research heroes who I refuse to name-drop in case he googles himself (as all good researchers do). Turns out Nick brought him onto one of our grants though so I’m hopeful for future run-ins! After a lab dinner at Mexican restaurant Cozymel’s, and a good solid sleep despite the tequila, Michelle and I and 90% of the Regina crew returned home on Sunday. Mumford and Sons concert on my birthday with Jordan and my family! It will be so busy but I’m looking forward to all of it. We will have lots to blog about, and hopefully more time with which to blog. Nice story Sam :-) That is great the Jordan’t parents are going to visit!